The presence of a French military aircraft over western Fiji surveying the damage from the recent widespread flooding has again highlighted the close ties between France and the government of the Fijian dictator, Frank Bainimarama. In stark contrast with Australia and New Zealand – which have shunned Fiji since Bainimarama’s coup in 2006 – France has continued to engage with the regime and provide it with vital assistance. The Fijian military especially values France’s willingness to give it an aerial reconnaissance and search and rescue capability it simply cannot afford. 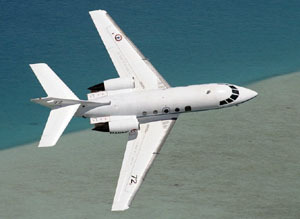 French military aircraft from neighbouring New Caledonia – like the Gardian 25F involved in the most recent mission – can be in Fiji in less than two hours. And the French have a history of not merely picking up the phone when the Fiji military calls but picking up the tab. In this instance, six French officers flew the plane to Nadi, collected their local counterparts and spent several days over remote areas assessing the needs of flood victims. The cost of around $100,000 officially came from the coffers of the French defence and foreign ministries and the government of New Caledonia. But there’s little doubt that this is all part of the overall strategy of France Incorporated to cement its ties with its neighbours and maintain control over its Pacific possessions – New Caledonia, Wallis and Futuna and French Polynesia to the east. In the 1980s, Grubsheet covered the Kanak uprising in New Caledonia – known locally as Les Evenements ( The Events ) – in which the pro-independence movement succeeded in getting an agreement from white settlers for an independence vote sometime after 2014. It came at a terrible price, including the eventual assassination of the main independence leader, Jean-Marie Tjibaou. But the 1988 Matignon Accords – named after the palace in Paris where they were signed – diffused an explosive situation that at one stage, threatened all-out civil war. Since then, France has poured hundreds of millions of Euros into New Caledonia, with a special emphasis on developing the previously backward Kanak north and Loyalty Islands. It’s also granted a high degree of autonomy to New Caledonia, altering its status within the French Republic from territory to “special collectivity” and holding elections for a local government headed by a president, Harold Martin – a Caldoche , as native born white settlers are known. Last year, a veteran pro-independence politician, Roch Wamytan, was elected President of the legislature – the New Caledonian Congress. Yet if anything, the prospects of an early pro-independence vote are receding, not growing, as the deadline looms for a referendum on whether to remain with France. Under Matignon, that vote can take place anytime between 2014 and 2019. But as the years have passed, there’s little agitation to cut the apron strings with “Le Metropole”. The more cynical might say the Kanaks have been bought off with European largesse. Yet there can also be no doubt that when ordinary New Caledonians cast their eyes over the neighbourhood, they can readily see that independence is no guarantee that their lives will get better. Au contraire. 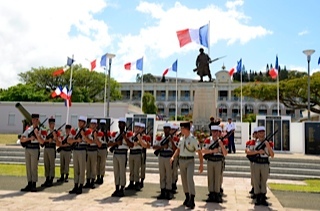 If anything, New Caledonia seems more European than ever, and especially what some locals refer to as ” La ville Blanche” – the “white town” – Noumea, the largely European capital. A vast new residential area between the city and the main airport, Tontouta, is being marketed to new arrivals from Europe, not just the French but other EU citizens. And not surprisingly, this has aroused widespread suspicion that France is trying to stack its “special collectivity” with white voters to stave off any independence vote indefinitely. Grubsheet will never forget the comments of a visiting senior EU minister whose news conference we once covered at the French High Commissioner’s office in Noumea. Already bemused that the Fosters Lager in the local supermarkets came from far-away London, not its relatively nearby home of Melbourne, our Pacific hackles were raised when this person said: “Of course, this is Europe. We are in Europe”. Small wonder that many islanders suspect that this mentality probably still governs much of French policy in the Pacific. As a recent report by the Australian Strategic Policy Institute underlined, France is one of only three powers to have a continuing direct territorial interest in the South Pacific – the others being the United States in American Samoa and New Zealand, with its constitutional ties with Niue, the Cook Islands and Tokelau. Australia has none. France is also the second biggest military power in the region, according to the APSI report. It has around two thousand troops based in New Caledonia with naval and air support, and the ability to deploy many more, like the Foreign Legionnaires who regularly visit Noumea. Paris is in the process of beefing up its military presence in New Caledonia. It’s strengthened its already close defence ties with Australia and isn’t coy about displaying them. Kanak eyebrows, if not hackles, were raised a couple of years back when Australia’s then Pacific Islands Minister, Duncan Kerr, arrived in Noumea on a French military jet. 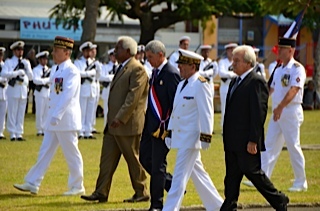 But France also realises that it needs good relations with its neighbour to the east, Fiji. And the French attitude to the repeated coups in Fiji over the years has been vastly at odds with the tough stance of Australia and New Zealand. After Sitiveni Rabuka’s coups in 1987, the French provided valuable support. The Fiji military received a Squirrel helicopter, which they eventually managed to crash into the sea, along with a fleet of Renault trucks, which were a prominent feature on Fiji’s roads until the spare parts ran out. Since the Bainimarama coup in 2006, the relationship has also been warm, with regular top- level meetings that are said to be routinely cordial and friendly. The French ambassador in Suva is a regular visitor to the Prime Minister’s office, in stark contrast to the Aussies, who haven’t been to see him for more than five years. France has also enhanced its aid and cultural programs in Fiji, including a significant boost in the number of Fijians learning the French language at the Alliance Francaise in Suva. It is, of course, all part of France’s determination to remain a Pacific power. The more friendly it is with Fiji and its neighbours, the less likely they are to agitate for the independence of French territories. It will not have gone unnoticed in Paris that Fiji has been highly successful at the UN in doing damage to the Australians, in particular, by encouraging other Pacific countries to back anyone but Canberra in its fervent quest for a temporary seat on the Security Council. France is also as concerned as the United States about China’s increased presence in the Pacific, and the more recent overtures of Russia, which is said to have gained a recent political foothold in Vanuatu, New Caledonia’s closest neighbour. 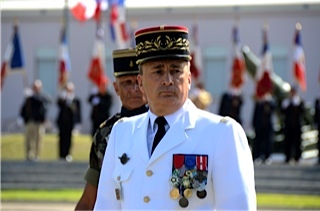 There’s also an emotional attachment between the French and the Fijians that is little known and even less appreciated – the fact that it was France which first enabled an indigenous Fijian the opportunity to display the military prowess that has become arguably the most potent symbol of Fijian national pride. In the Great War of 1914-18, a Fijian chief called Ratu Lala Sukuna wanted to fight the Germans on behalf of the British. But his colonial masters had a policy of not throwing indigenous Fijians into the conflict and Ratu Sukuna was refused. Undeterred, he crossed the English Channel to France and was accepted. He joined the French Foreign Legion and fought with such valour and distinction that he earned France’s highest honours – the Medaille Militaire and the Legion d’ honneur. 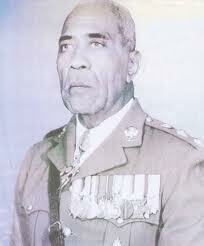 Those medals are on display in the Fiji Museum and the story of Ratu Sukuna is known to every Fijian schoolboy. He went on – as Ratu Sir Lala Sukuna – to become one of the two most significant Fijian figures of the 20th century, along with his protege, Ratu Sir Kamisese Mara, the founder of modern Fiji. France’s role in helping to create a Fijian hero is also not forgotten. 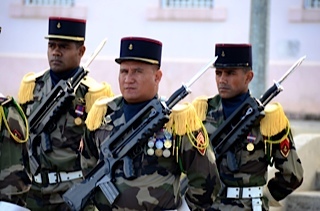 There’s a sentimental link to the French in the Fiji military that survives to this day and is reciprocated. While Australia and New Zealand have turned their backs on Frank Bainimarama, France has not. All of which means that he not only doesn’t mind sharing his own backyard with the Europeans, he’d actually prefer – as things stand – that they stay. Vive la Pacifique Francaise!